A while ago I wrote a post about easy low light plants for beginners. While this plant didn’t make the list because it needs a little bit more light to keep its variegated form, (and also I hadn’t personally taken care of one until now) it still stands out as one of the easiest house plants to love. I mean, just look at it! What is not to love? Their colorful olive-green and purple leaves make a beautiful trailing display. The beautiful pattern on this plant doesn’t end with the leaves. The stems have beautiful patterns too! They make great house plants for beginners. What plant am I talking about? 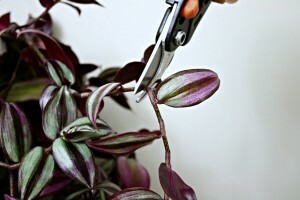 Well, there are different varieties of this plant but all are called Wandering Jew. I read somewhere that they come second to the spider plant in terms of propagation success. 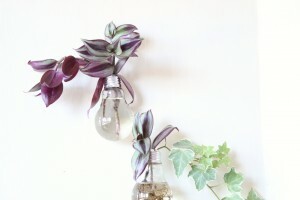 The one featured here is Tradescantia zebrina (formerly Tradescantia pendula). It grows likes nobody’s business. I purchased two 4 inch pots of this plant with about 8 stems total last December and re-potted them in a hanging planter. In the span of 5 months, they’ve grown from about 15 cm long to 100 cm now. Talk about fast growth! They branch out even at soil level causing them to have a full and lush appearance if well cared for. Propagation: They propagate very easily. Just cut them below a node, remove a few leaves and place them in soil or water anytime of the year. 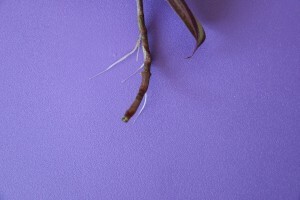 You do not have to wait for the cut end to callous before putting it in soil or water. All you need is an inch of stem cutting and at least one leaf, although having more leaves and a longer stem will provide faster results. I cut a a few stems from my overgrown plant and rooted them in water. I checked on them 8 days later and there were new roots already. Light & Temperature: Place in a warm and well-lit area but avoid direct sunlight as this will cause the leaves to curl around the edges and will not be as lush. You can see from the picture above some of the leaves are all purple and no green. I wonder if it is due to low light levels in my north facing window. I rotate the plant every few weeks (should be more frequent than that) to keep an even growth. I should probably be doing it every week when I water them. I always thought variegated plants lose their color and become green only when in low light so I am not sure why the opposite is happening. They are not winter hardy so bring them indoors if temperatures fall below 10o C. Extreme hot or cold temperatures can cause leaves to drop so position it away from draughts. Water/Moisture & Feeding: Water regularly to keep the soil moist but not soggy. I have mine in a hanging planter with drainage holes. I hang it over the sink once a week to give it a good soak until water drains from the bottom. Lack of water causes the stems to grow limp (which I witnessed once), but a good soak corrects the problem. This plant can survive in normal household humidity, although misting leaves occasionally if you spot shriveled or brown tips will be beneficial. My apartment is pretty dry but I don’t mist my plant at all and they seem to be growing wildly. A regular liquid houseplant fertilizer can be used every 2 weeks during the growing season. Other Care Tips: It is advisable to pinch the young stems to promote bushy growth as they can become quite leggy. Remove dried brown leaves when you see them. This is sometimes tricky because the dried leaves seem to crumble to dust the moment you touch them. Common pests of this plant include red spider mites and aphids that can cause pale sticky leaves. Cut away affected stems and treat with an insecticide. 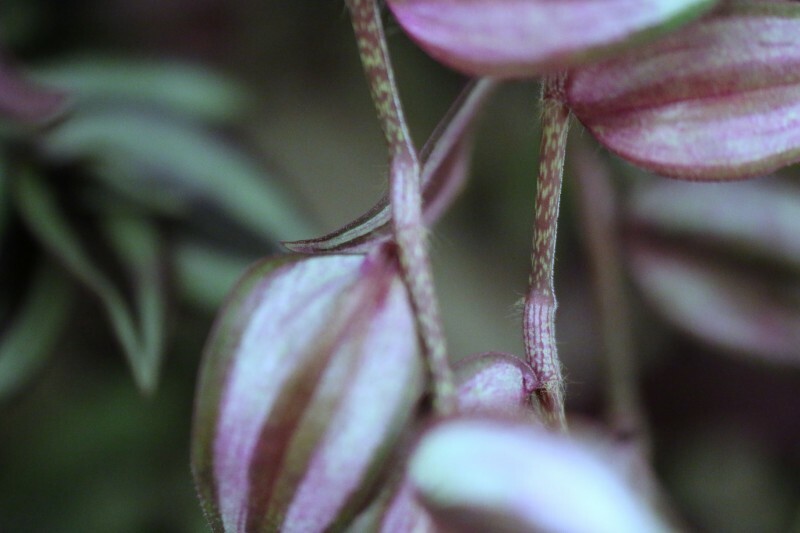 The wandering Jew is grown for its foliage but it is a nice surprise when you spot a flower on the plant. They can flower anytime of the year, although it is more common in spring and summer. 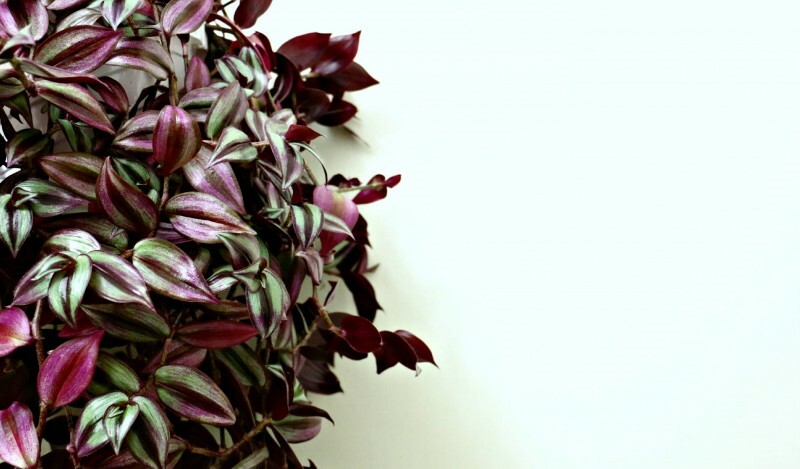 Now, I was curious how this plant got its common name – Wandering Jew. There is a legend about a wandering Jew. There are several variations of this story. One version is that Jesus cursed a man who taunted him on his way to Golgotha to be crucified. The alleged curse was that this man would roam the earth until Jesus’ second coming. This story, by the way is not in the Bible in case you were wondering. The truth of this legend is questionable but I see why this plant would be named after such a legend. They appear to be very hard to kill and their fast propagation and creeping habit ensures that they can truly live forever! Any of you have a Wandering Jew? Share your experiences below. My wondering jew is in a west window that doesn’t get direct sunlight and the tips are still curling. My house is in Alaska and very shaded. If I put the plant away from the window I’m worried it won’t get any light. The vines and leaves are shooting straight up. 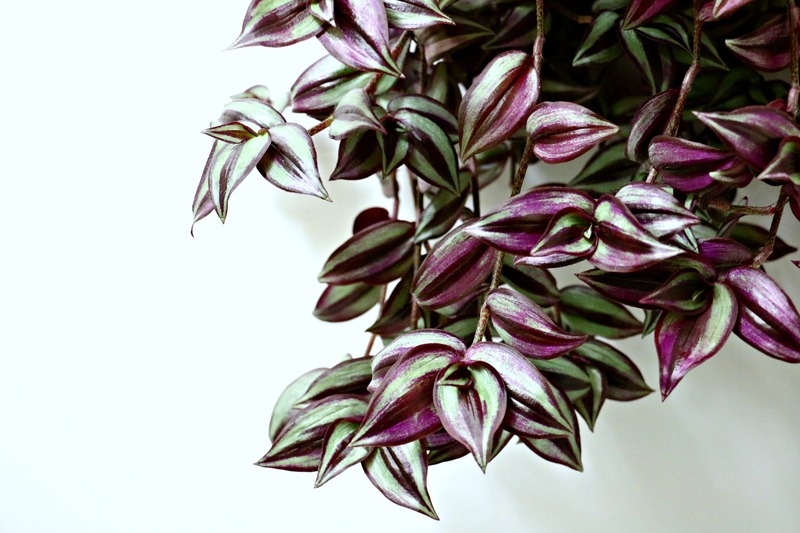 I have a variegated tradescantia, very succulent and stiff, but leaves are cream central, with dark green edge – oppositemost tradescantias. Can you identify?? 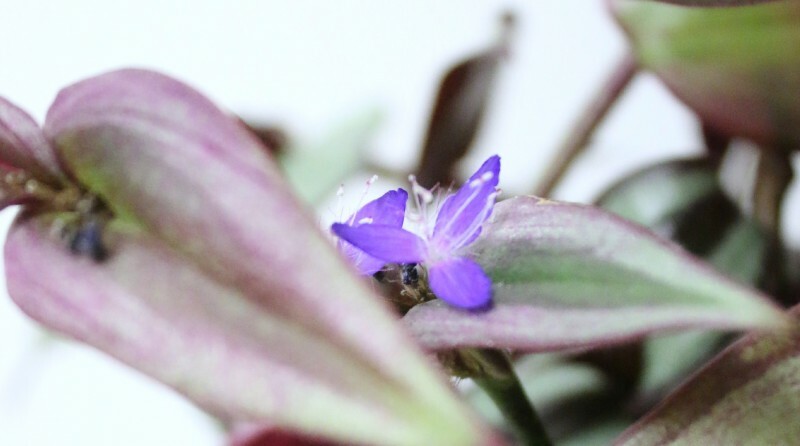 Tradescantia is easy. But, I recommend Sansevieria. Even people with brown thumbs can grow Sansevierias. There are dozens of varieties to choose from. Short. Tall. Wide. Narrow. I put my plants outdoors on the porch in summer and they are happy as can be. In the fall I bring them in and mostly don’t water them. They sit dormant in my living room window. My one nearly died (courtesy of my kids) but I have been spending the last month trying to resuscitate it. Great tips. Thanks! 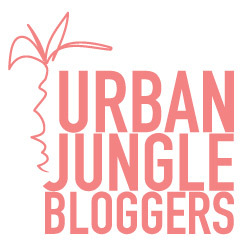 Stumbled upon your blog this morning, very nice! Thank you. I found your blog too via instagram. I love discovering blogs about botany. Excellent photography!